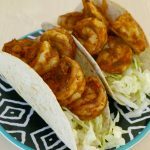 Make your own taco shells for these delicious low carb shrimp tacos! The first task is to marinate the shrimp. I prefer to use tail-on, shell off raw shrimp for this, but whatever you prefer will work fine. Personally I am happy to eat the shrimp tails but I know many people disagree! Mix a marinade from tomato sauce, paprika, cumin and dried oregano. 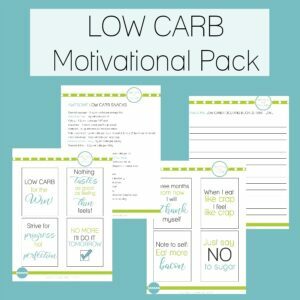 You could also add some spice at this point – some adobo sauce would be perfect – but I usually cook this without as my husband isn’t a lover of spice – unlike me! Add the shrimp to the marinade, cover, and refrigerate for at least two hours. 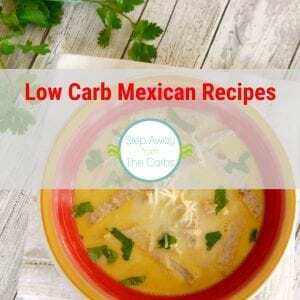 The low carb taco shells can be prepared in advance – just place small low carb tortillas onto a piece of baking parchment and drape them over one or two bars on the rack in your oven. 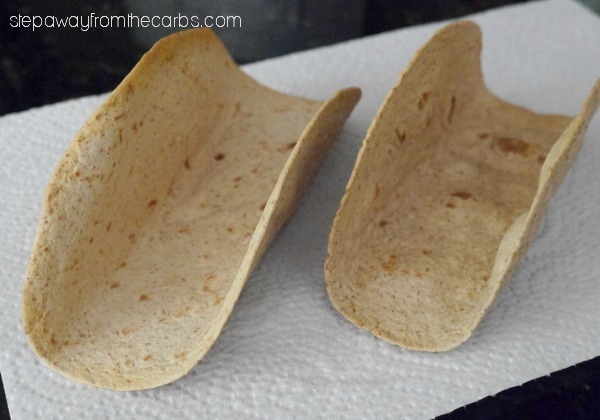 Bake on a medium heat until they are crispy. 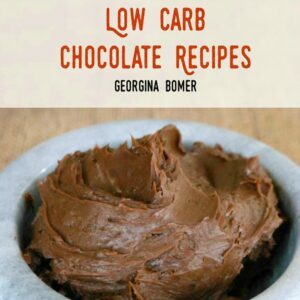 This method was inspired by KetoDietApp. When you are ready to cook, the shrimp can be cooked however you like – on skewers on the grill, or under the broiler. Or even just sautéed! 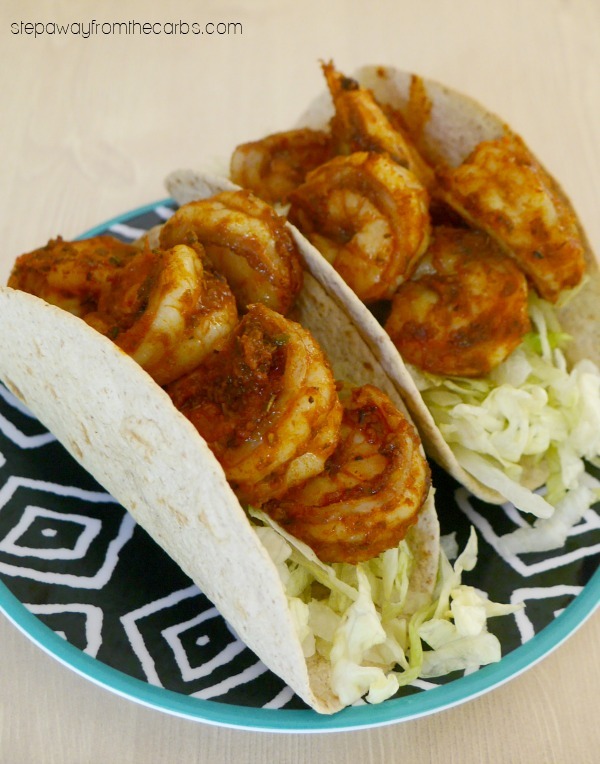 Load up your taco shells with some shredded lettuce then add your shrimp. Enjoy! Combine the tomato sauce, paprika, oregano and cumin and marinate the shrimp in the mixture for at least two hours, covered and refrigerated. 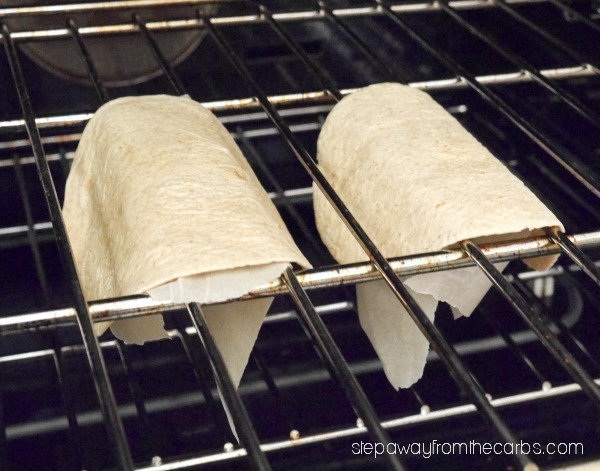 Make the taco shells by placing the tortillas on a piece of baking parchment and draping them over the bars of the oven rack. Bake on medium heat until crispy. Cook the shrimp on the grill, under the broiler or in a sauté pan. Divide the lettuce between the taco shells and add the cooked shrimp on top.